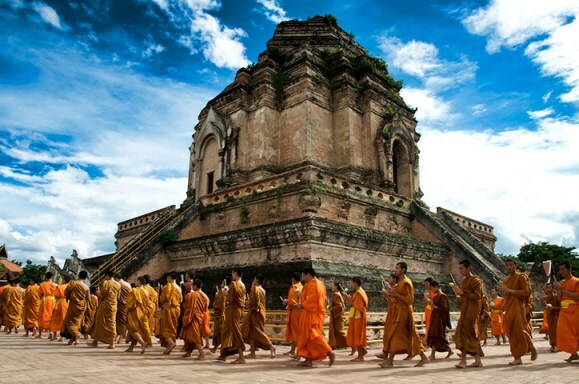 Many exciting activities to do and beautiful attractions to visit in Chiang Mai, Thailand. 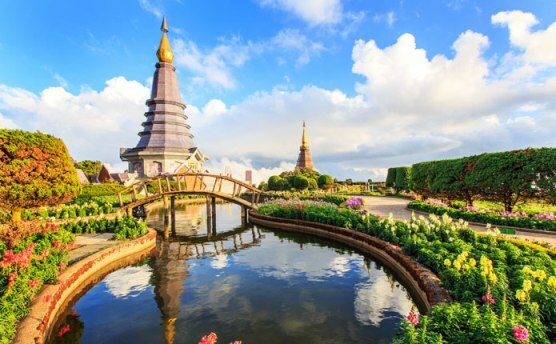 This mountaintop temple is a not to be missed attraction in Chiang Mai. 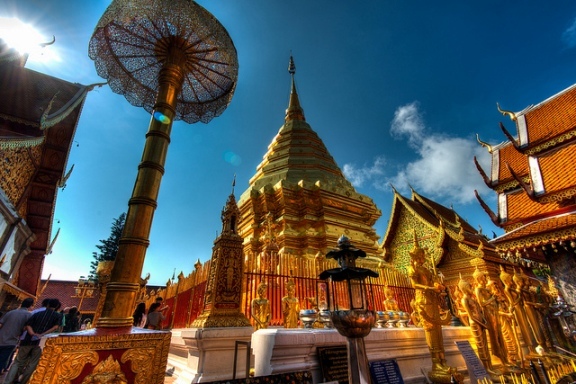 Wat Doi Suthep's central shrine contains a much-revered, seated Buddha, and is one must-see place in the city. To get to the temple, you can choose among hiking, renting a motorbike or hopping into a songthaew (red trucks that essentially operate as communal cabs). If you take a drive, you can visit the whole areawithin 2 hours. There are many souvenir shops at the base of the staircase leading up to the temple. Although the staircase is steep, you should brace yourself to climb up as the view along the way is worth a try. Statues of two demons guard the entrance to the temple precinct. Generally only two of the six gates leading to the gallery and the chedis are open. The gallery is adorned with statues of Buddha in the Chiang Mai and Sukhothai styles. The temple itself is ornate, with many representations of the Buddha, detailed dragon statues, and elephant carvings. There is also a small museum on the premises. On top of the mountain, you can also look out over the entire city and spot the chedis atop other wats poking out among the clustered buildings. Doi Pui is a small Hmong village yet it is admittedly more tourist oriented than authentic. However, you can find a small exhibit of a traditional hill tribe home, and information on the history of the many groups that have settled in the Thai mountains in past generations. If you're feeling particularly touristy, you can dress up in ethnic garb for a photo shoot. There are many small shops where you can purchase hand-woven textiles, handmade jewelry, tea, and other goods. You can also visit a large garden with a diverse array of plants and enjoy the breathtaking view from the village. About 2 hour drive from Chiang Mai city, Doi Inthanon is a very mountain with the highest peak in Thailand. The Doi Inthanon National Park has many the natural wonders that worth to discover. Trekking and hiking the mountain are the common activities or you just take a more leisurely route around the park. Several waterfalls and a hill tribe village are other draws, along with two pagodas built to honor King Bhumibol Adulyadej and Queen Sirikit. If you want to explore the area within few hours, you should rent a motorbike or car with a local guide as this area is quite large. Traveling aroung Thailand, you will see many ruins but there's something about Wat Chedi Luang that is particularly beautiful and haunting. Built in 1401, the imposing structure was damaged during an earthquake in 1545. But it remains remarkable today, and you can still see the massive elephant carvings that adorn it. Beneath a huge gum tree on the left of the entrance to the precinct stands a delightful little temple, the Lak Muang. Built in 1940 on the site of an earlier wooden building, the shrine is the abode of Chiang Mai's guardian spirit (Lak Muang). According to tradition, if the great tree should fall, disaster will overtake the city. The temple is something to behold at any time of day, but it's particularly lovely at night, when it is all lit up. 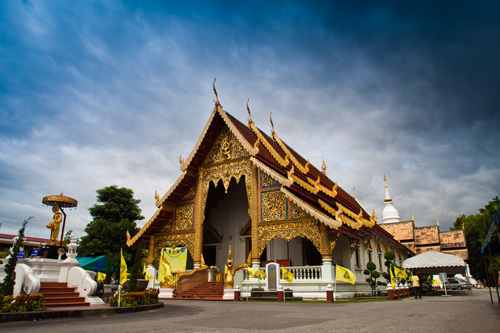 Located at the heart of the Old City, amidst the alleys and heavy motorbike traffic, Wat Prasingh is most visited place in Chiang Mai where travelers spend much of their time. Constructed in 1345 by an ancient king in his father’s honor, Wat Prasingh is the largest wat in the city. The decadent structures are impressive, and it's an especially great place to check out on Sundays. You can find best Thai street food in Chiang Mai. Every night, vendors set up at the Chiang Mai Gate and sell everything from pad kra pow (spicy meat and basil dish) to the perfect dessert of fresh mango sticky rice topped with coconut milk. The market is held seven nights a week, but it's best to go on weeknights since there are fewer vendors on Saturday and Sunday evenings. There are a lot of markets in Chiang Mai and the Sunday Walking Street is a must to visit. You should go there early to avoid the crowds The main market thoroughfare is Rachadamnoen Road, which begins just behind Thapae Gate, where you'll find vendors selling handcrafted lamps, dolls, soaps, jewelry, clothes, Christmas ornaments, local handicrafts, and just about every other keepsake you can imagine. As you reach the end of the first block of Rachadamnoen, you'll find yourself flanked by two temples. The courtyards of both are filled with food stalls offering a grand mix of pad Thai, Japanese curry, sushi for 15 cents a piece, samosas, fried bananas, and dumplings. The Saturday Walking Street on Wualai Road is a slightly tamer, and slightly less crowded, version of the Sunday market. You'll find it just behind the Chiang Mai Gate, and it's a great place to pick up hand-woven clothing, pillow covers, purses, wallets and other items sold by members of local hill tribe communities. This is a great spot for shopping, if you are prepared to do some haggling. 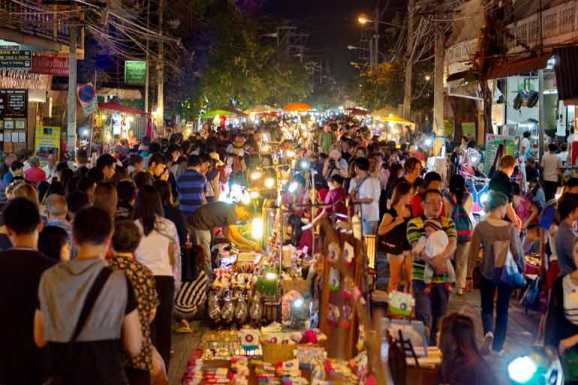 Because the Night Bazaar attracts many tourists, you'll want to be on your guard against getting ripped-off. But there are some great finds here, from clothes and scarves to carvings and housewares. When you're finished shopping, you can take in a muay Thai boxing fight at the stadium on the premises. Muay Thai fights are a big part of local culture, and can add an exciting element to your stay in Chiang Mai. Entrance to the fights is usually between 200 and 400 THB. Beautiful and relaxing as Chiang Mai is, it also attracts many humanitarians focused on the plight of refugees from Burma and the marginalized hill tribe communities. 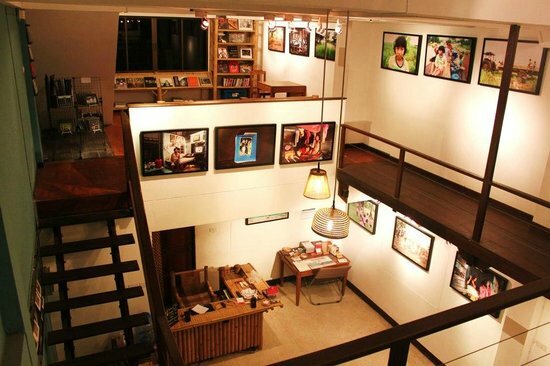 Documentary Arts Asia is a gallery space that holds regular documentary and Asian film screenings and events related to the political and humanitarian situations throughout Asia. They have a library that is open to the public for browsing and continually rotate photographic exhibits at the gallery. It's an excellent place to learn more about the historical and political contexts of Thailand and the rest of the region. You may read about many elephant camps around Chiang Mai have been criticized for treating the animals poorly and overworking them but the Elephant Nature Park is quite different. 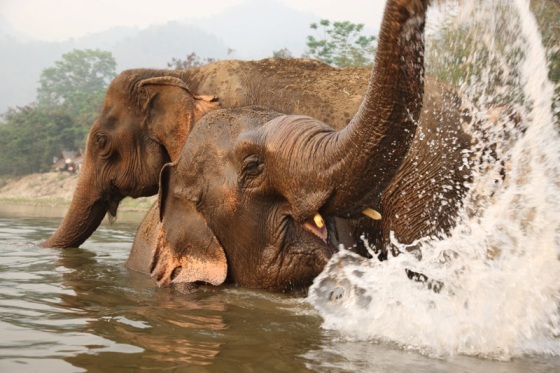 Visitors are invited to spend a day volunteering with the elephants, feeding them and bathing them in the river. Most of the elephants are rescues, having suffered as show or labor animals. Once they come to ENP, they are no longer workers and are treated gently and respectfully. A day spent here is an eye-opening experience, as you both get to spend time up close with the elephants and learn about their plight. The cost of volunteering includes transportation and lunch, and the money goes toward maintaining the grounds and providing for the animals. Be sure to book in advance, as the volunteer spots do fill up ahead of time. 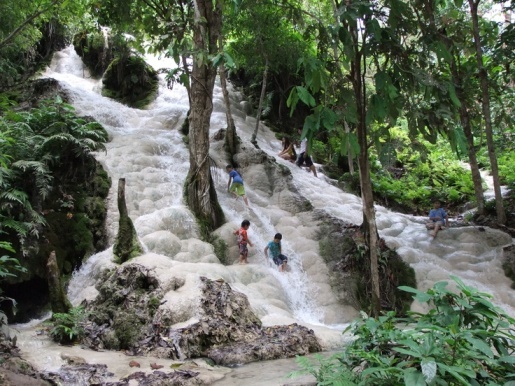 It is worth to spend a day out of the city to explore these waterfalls. The wooden forest surrounding the falls is tranquil and peaceful, but the special and gorgeous draw is the fact that the limestone is really "sticky" even as the water runs over it. So you can comfortably climb up and down. It's a real treat, and provides a nice complement to some of the more traditional tourist activities. 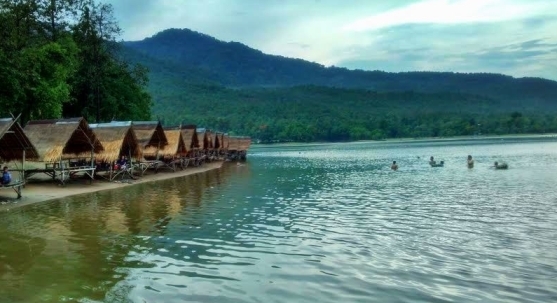 There are several floating houses at Mae Ngat Dam, just 30 minutes away from the city.. You will reach these small bungalows on the water by boat. This is the perfect place for sunbathing, paddling around the lake or just lazily enjoying the amazing natural beauty of this park. Boasting some of the most spectacular stalactite and stalagmite formations in the country, Chiang Dao Cave stretches many kilometres into the mountains. Chiang Dao cave is believed to connect with several other caves, before eventually emerges at the other end somewhere in Shan State across the border. The official figure, though, is 12 kilometres, and you can explore only a small part of it. 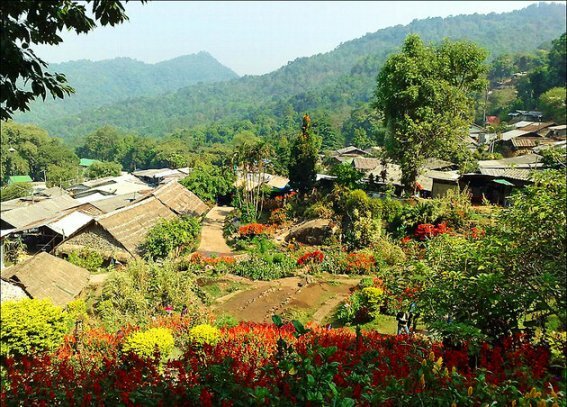 Further up from Chiang Dao Cave, a visit to the Padung Village introduces you to the ‘Long Neck Karen’ ethnic hill-tribe. The women wear brass rings around their necks, wrists and ankles as part of their culture. It is a good idea to explore, with respect, the village a little to get a feel of their culture and way of life, before supporting their income by purchasing a few souvenirs (not a requirement though).